What exactly does that mean? Simply put, your project will be designed, assembled and installed according to industry leading practices that have stood the test of time. All trades have what's known as "Best practices" which have evolved over time to meet the demands of today's extreme weather conditions. It all starts First with the “Right Design” to maximize performance and enhance the beauty of your property. Second is the "Scope of Work" such as the replacement of the roof, the gutters, the chimney, windows or siding to be included in the design. Third are the “Specifications" which identifies the components and how everything is assembled. Fourth, is the selection of appropriate materials based on the needs of the project and the customer's level of investment and sense of aesthetics. Here we may have a certain range of material choices. In most cases, we can provide a "Good, Better, Best" product selection which range from satisfactory to superior performance and aesthetics. The choice is yours. The Fifth and final element is the right craftsmanship. Since these features or systems come unassembled, the capability of the craftsmen doing the work is absolutely critical. Their training and skills will greatly impact both performance and longevity. Featured in the backdrop is Paul (right) a Sprague craftsman and trainer of 28 years who trained Jake (left) 18 years ago. Our investment in training insures that your project will be BUILT TO LAST. Most contractors only provide a one year warranty for their work. But what if something goes wrong in year two or three as a result of the workmanship. At G.F. Sprague we want you to be confident that you made the right choice. Because we do it right the first time, there is a relatively low risk of future problems throughout the useful life of the product or system we install. As a result, we can provide the following warranty with great confidence that you'll probably never need it. It is important to remember that regular maintenance is necessary for any product or system which is exposed to the elements over time. 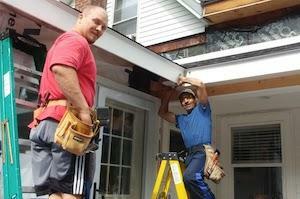 With G.F. Sprague, you don’t have to worry that our workmanship will increase the burden. Our warranty has real value and does not contain many of the common “small print” exclusions that others use. Upon final payment, the warranty protects you against any and all problems related to workmanship for an unlimited time and for an unlimited number of owners throughout the useful life of the product or system we install. So, any owner will have full rights period! That's right, we pledge that the work performed by our craftsmen will be properly installed and that the materials or system that we installed will never fail prematurely solely because of our workmanship. To further insure great performance of your new exterior you’ll get our excusive “Real Deal Warranty Inspection” (at no additional charge). What Exactly does this mean? We will perform inspections over the useful life of the product or system we install to ensure that Mother Nature has not caused damage from her destructive forces. This is particularly important now as our New England storms become more destructive, more frequently at an alarming rate. It's sometimes called "global weirding". These inspections often times will prevent a Small problem from becoming a Big Headache, eliminating something that could have prevented had it been caught earlier on. This is also a condition of the warranty so be sure to be available for these important inspections.